Just as the ripples streamed through a point. 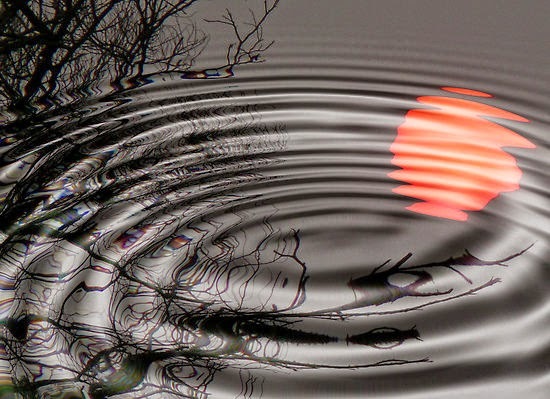 Those ripples followed each other. In a perfect circular shape. And merged with the shores. Touching the edge of the pond. Created for a short span. No matter who brought those ripples. Whether a pebble or a Kingfisher. It brought to motion the calmness. Some see beauty in calmness. Some found meaning in the motion. Author's Note: It all comes down to perspective. P.S. : It is time for introspection, where do you find solace, in ripples or in calmness. Loved this narration of ripples vs calmness. Isn't one followd by the other 'always'? I am assuming that you meant the cycle of ripples and calmness. It depends a lot on an individual, some people cannot hold on to emotional turmoil while some just are not comfortable with a calm life. Thanks for stopping by.